Last week was a busy one at the state capitol in Salem, as legislators held their latest round of interim committee meetings. Four of the six committees to which I’m assigned met during that time. Needless to say, it was a very busy week. The Joint Interim Committee on Ways and Means Subcommittee on Transportation and Economic Development met on Monday. We heard from the representatives of the Oregon Business Development Department about its State Trade and Export Promotion Program and from the Oregon Department of Transportation about railroad-highway crossing improvements. To view the exhibits displayed during the meeting, or access a video recording of the meeting, click here. A highlight of the day was a noon press conference I participated in regarding the implementation of legislation aimed at combating human trafficking. I was the chief sponsor of House Bill 3143, which passed through all of its committees, the House and the Senate on unanimous votes and was signed into law by Governor Brown in early June. The bill allows non-profits to supply the Oregon Liquor Control Commission with informational materials about human trafficking, including stickers. OLCC will include the stickers with each license renewal they issue to the facilities they regulate. This is important because victims of human trafficking have few opportunities to escape their captors. It has been determined that one of the times they are away from them is when they’re using the restroom. Having stickers on the bathroom stall with information on how they can get help will go a long way towards solving this very important problem. Monday’s press conference was the kickoff of a yearlong campaign to educate Oregonians about the plight of victims to this horrific crime. A former victim was among those who spoke, and courageously told her story in an effort to prevent others from being subject to such abuse. I was honored to work with other legislators to pass HB 3143, including Rep. John Huffman (R-The Dalles), Rep. Kathleen Taylor (D-Milwaukie), as well as Nita Belles. She is the managing director of In Our Backyard, a non-profit devoted to this issue. Several legislators who helped pass HB 3143 appeared at the Monday, November 16 press conference announcing the rollout of the anti-human trafficking stickers. They include (from left) Rep. Carla Piluso (D-Gresham), Sen. Jackie Winters (R-Salem), Rep. John Huffman (R-Hood River), Rep. Kathleen Taylor (D-Milwaukie) and Rep. Duane Stark (R-Grants Pass). I am pictured here with Nita Belles, managing director of the In Our Backyard non-profit organization. Click the "play" button to watch a video of the press conference. My day started in the House Interim Committee on Revenue, where a variety of topics was discussed. The Legislative Revenue Office provided us with an analysis of the state’s marginal effective personal income tax rates and background information on the property taxation of non-profit organizations. Information regarding unpaid debt collections and the implementation of House Bill 2089 was given to us by the Department of Revenue. Representatives from Lane County gave a presentation on modernizing property tax assessment techniques, and the Oregon Liquor Control Commission discussed that agency’s revenue trends. 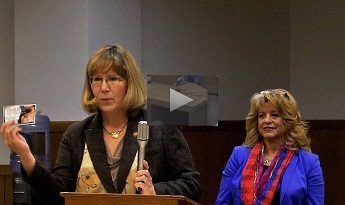 Materials and the recording of that meeting can be accessed by clicking here. The House Interim Committee on Agriculture and Natural Resources heard a fire season update from State Forester Doug Decker and other Oregon Department of Forestry (ODF) officials. There were also updates on the Coastal Multi-Species Conservation Plan and a hatch box program done through the Oregon Department of Fish and Wildlife, and representatives from the Oregon Mining Association testified about some of the issues facing their industry. The Joint Interim Committee on Ways and Means met in the morning and had a very robust agenda. Compensation plan changes for the Public Defense Services Commission and Judicial Department were discussed by officials from the Department of Administrative Services. Information about the Local Government Intermediate Term Investment Pool was presented by the office of the State Treasurer. Representatives from the Department of Education discussed charter schools and programs involving child nutrition, school hospitals and farm-to-school efforts. The Oregon Health Authority covered a variety of topics, including a Medicaid Management Information System, the surveillance of birth defects, the development of 2016 rates for the state’s Coordinated Care Organizations and an Environmental Information Exchange Network. Technology improvements at the Department of Justice and capitol construction projects for the Military Department were also on the agenda, along with an analysis of the Department of Corrections’ inmate population. Oregon’s health insurance marketplace was discussed by employees of the Department of Consumer and Business Services, and a debris removal project was talked about by Marine Board staff. An electronic filing system project for the Government Ethics Commission was another topic. So was the Department of Public Safety Standards and Training’s basic police and basic corrections classes and its Center for Policing Excellence. The Department of Revenue’s processing center system modernization project and recreational marijuana tax cash management implementation also were included as part of the agenda. For more information on this meeting, click here. As you can see, the Legislature remains busy even when we’re out of session. All of these committees dealt with issues that have the ability to affect Oregonians from all walks of life. The best way to keep up with what is going on at the capitol is to go to www.oregonlegislature.gov. That website contains a wealth of information about the processes and the proposals that we consider when we’re in session and during the interim.